Interior design for a bookstore and exhibition space. Ras bookstore is the main point of sale for Actar group, one of the biggest art and architecture publishers in Spain. Following Birkhauser’s acquisition of Actar, a competition was held for the refurbishment of the bookstore. Materials and lights provided by Actar group partners had to included in the design. 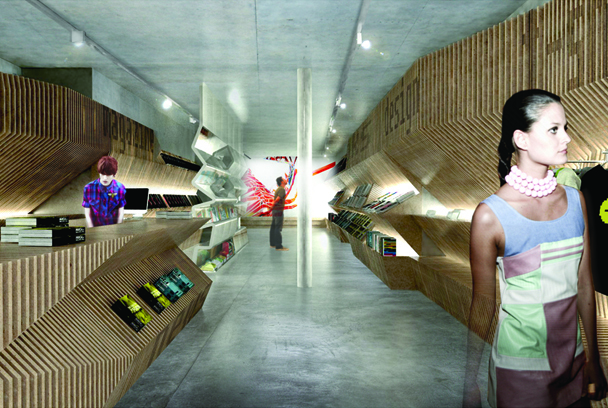 In the proposed design, existing walls are lined with a continuous bookshelf whose cross-section changes to accommodate the different kind of publications and products on display (books, magazines, merchandise, etc.). The bookshelf structure is made by linking together multiple, laser-cut cardboard panels. A line of lamps runs inside a recess with the cardboard panels working as a filter.